Left: Aidan McDonald, Juspin Jones, and Damien J. Wallace in " 'Master' Harold . . . and the Boys"; Right: Walter DeShields (left) and Carlo Campbell in "Egoli." Through April 7 at EgoPo Classic Theatre. 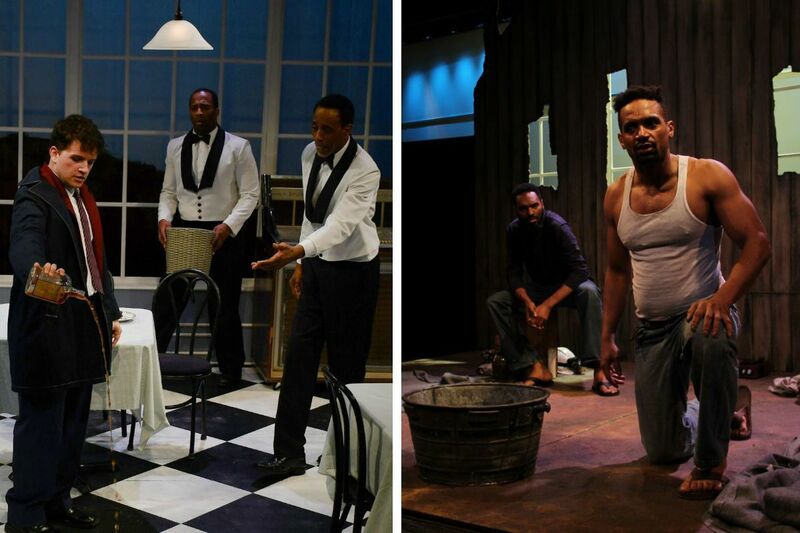 Two South African playwrights cry the beloved country in EgoPo’s fine productions of two fine dramas: Egoli: City of Gold by Matsemela Manaka and "Master Harold”…and the Boys by Athol Fugard. Both plays were banned back in the terrible days of apartheid, and they conclude EgoPo’s season under the dreaded banner of CENSORED. Each provides a vivid evening in the theater, but it is particularly illuminating to see them back-to-back. Fugard, the great anti-apartheid voice, is now, at 86, the indisputable granddaddy of South African drama. Consider these masterworks: Bloodknot, The Road to Mecca, and My Children! My Africa! among many many others. Boesman and Lena is currently on at Signature Theatre in New York, and The Painted Rocks at Revolver Creek, just published, is gentler, demonstrating that all is not yet rosy in postapartheid South Africa. Manaka, a multitalented Soweto voice, was killed in a car crash in 2008. He was a prominent voice in social protest — different in style and necessarily different in perspective from Fugard’s white voice. His work was often presented illegally in church basements for black audiences, and it is stunning to try to imagine what Egoli would have felt like to people who were seeing their lives speak to them from the stage. Egoli, directed by Katrina Shobe, is the name of a “city of hatred, city of misery,” where notorious gold mines had men in chains digging far down in the earth. Two of those men are John (Carlo Campbell, an intensely physical actor, good with the accent) and Hamilton (Walter DeShields); one is a messy drunk whose family is starving back home, and the other is a tidy rationalist. The play opens in their shack as John drinks beer after dancing to records, while Hamilton reads the newspaper. They will enact their present — John is fast with a knife and nostalgic for ancestral songs — as well as their past, their escape from the chain gang with its cruel white overseer, their fantasies about prostitutes, with allusions to murders and rapes. We see the brutal work they do, drilling and chopping and shoveling, until the inevitable terrifying explosion. There is an inevitable explosion in “Master Harold,” too, although this one is emotional, and no less terrifying. Hally (Aidan McDonald) is a schoolboy whose father is a crippled drunk who has made his son’s life a misery. Sam (the elegant Damien J. Wallace) and Willie (Juspin Jones) work at his mother’s tearoom. Each day Hally comes to the tearoom instead of going home. Sam will give him lunch and continue his own education while helping the boy with his homework. Willie is eager to learn dance steps from Sam so he can enter the annual contest in two weeks. His problem is that Hilda, his dance partner, has not come to practice ever since Willie beat her for being slow to learn. As is true in Egoli, the women always suffer from male rage, frustration, and despair. Sam has been a surrogate father to Hally, intuiting the boy’s need for both advice and a role model. They reminisce about a kite Sam made when Hally was 5, a luminous memory that turns into a profound metaphor, as does championship ballroom dancing, where nobody bumps into anybody else, a vision of a graceful and collision-free life. Lane Savadove directs this strong production. Typical of EgoPo’s and Savadove’s theatrical sense, with scenic designer Dirk Durossette’s skill and imagination, even entering the theater is a dramatic event. For Egoli, we walk through a narrow mine shaft — black walls bashed together with rough pieces of lumber. When we arrive at our seats, we face a broken upstage wall and a stage bare except for two blankets to sleep on and a record player. For “Master Harold” we enter through a charming garden path: green grass lined with potted flowers. When we arrive, sitting in our same seats, the stage world has been transformed into a brightly lit teashop, complete with a glass cake stand and ironed tablecloths where the “boys” in their immaculate summer clothes serve customers. Both plays show us that history is always more present than anyone thinks. We don’t need South Africa to tell us about the legacy of racism, which makes EgoPo’s decision to focus on South Africa make complete sense. A game Sam and Hally play is to name a “man of magnitude” who has “benefited all mankind”; in the meantime, they “just go on waiting.” With hindsight, we can see that they are waiting for Nelson Mandela, although with additional hindsight, we can also see that the waiting inevitably continues. As Fugard said, “My life’s work was possibly just to witness, as truthfully as I could, the nameless and destitute of this one little corner of the world.” As audience, our job is to witness these plays. In repertory through April 7 at EgoPo Classic Theater, Latvian Society, 7th & Spring Garden Sts. Tickets: $35-$48. Information: 267-273-1414, egopo.org.